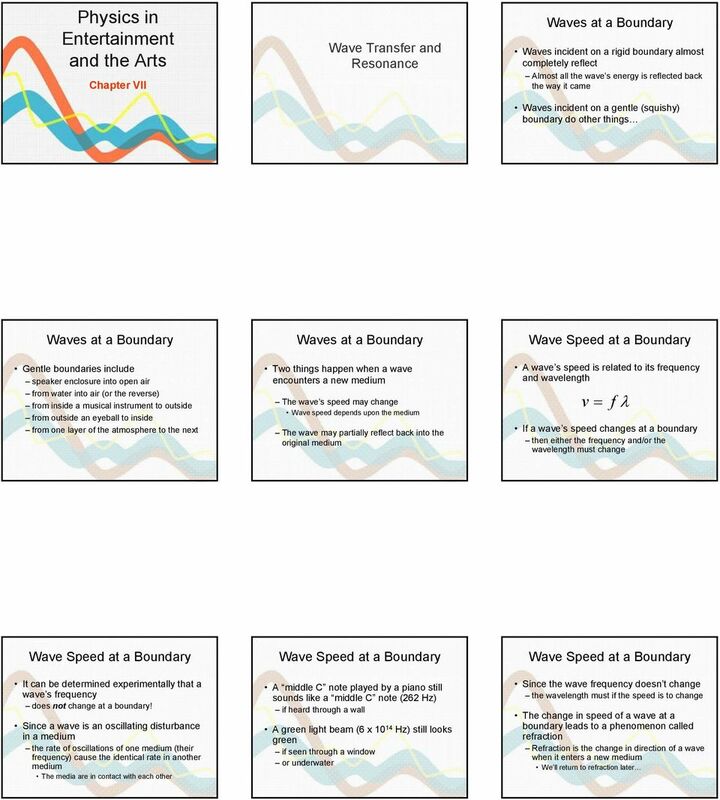 Download "Physics in Entertainment and the Arts"
2 When a wave hits a gentle boundary some of the wave energy will be transmitted into the new medium and some will be reflected back This reflected energy will create a standing wave in the original medium This effect can be good or bad Good You need a standing wave (created from the reflected energy) to produce sound in a musical instrument The transmitted energy is what leaks out and is what we actually hear Bad Reflected electrical wave energy from the speaker terminals on a stereo back into the stereo s electronics This is called impedance mismatch and results in wasted energy and annoying ringing in the sound created Maximum energy transfer happens when the electrical wave hits a minimal boundary mismatch at the speaker This is called impedance matching Maximum energy transfer out of a musical instrument would require the instrument be impedance matched with the surrounding air This is easy to accomplish For example, the end bell on a trumpet could be flared gently outward so the sound waves would slowly fan out and not be reflected This, however well it would transfer sound energy out of the trumpet, would result in no sound at all! 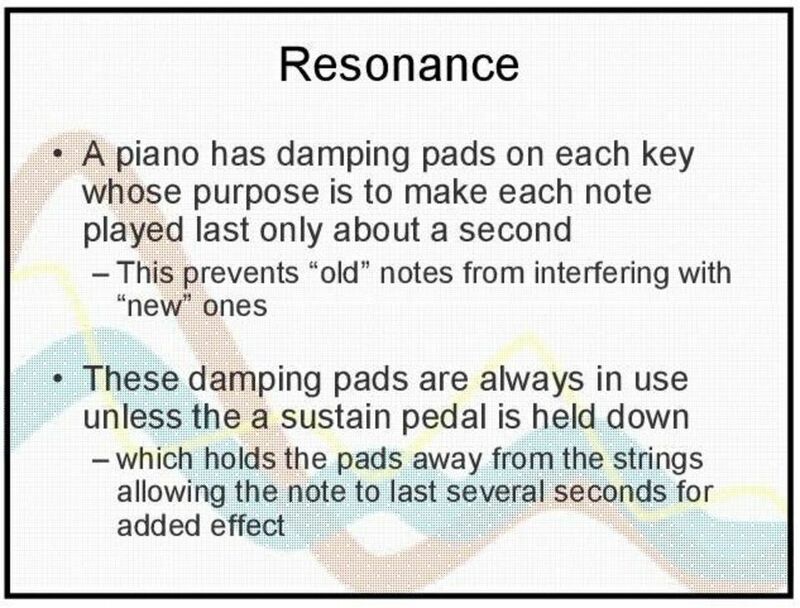 The sound we hear is from standing waves within the trumpet pipe If there are no wave reflections from the bell end there is no standing wave to produce the sound!!! So in order to produce sound musical instruments must have some reflections to create standing waves Summary for a musical instrument: Perfect impedance matching = no sound Another effect of impedance mismatch and the resulting reflections is the phenomenon of resonance is the sympathetic ti vibration of a nearby object An object vibrates at the same frequency as the wave it is immersed in can be considered to be a matching in frequency between a source of vibrations and a responding system The vibrations produced in a system provide feedback to the source locking them into synchronicity and amplifying the vibrations sometimes disastrously! 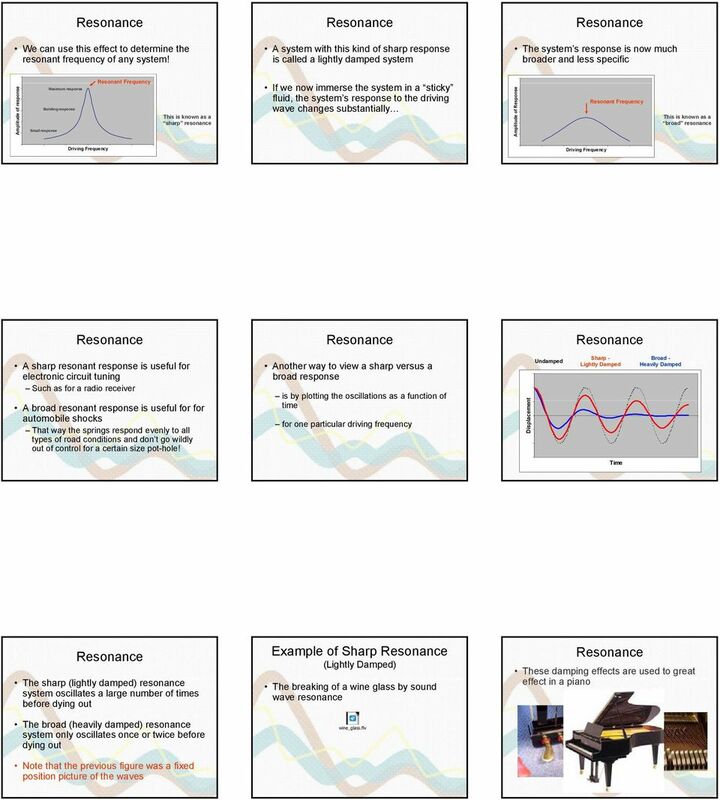 Resonance. 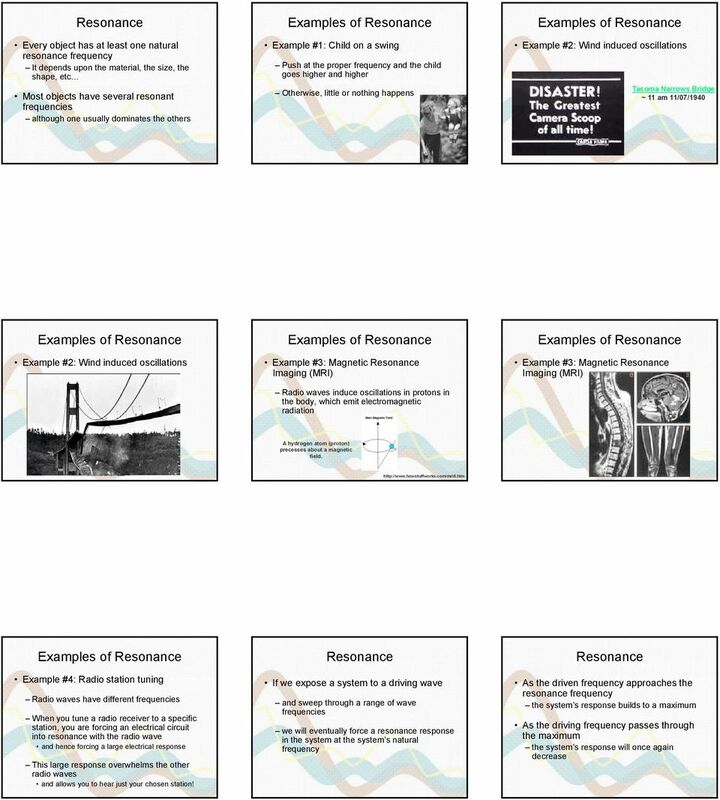 The purpose of this experiment is to observe and evaluate the phenomenon of resonance. Final - Physics 1240 Spring, 2010 version 1. Intensity ratio 1 db db db db db db db db db 7. Section 5.0 : Horn Physics. By Martin J. King, 6/29/08 Copyright 2008 by Martin J. King. All Rights Reserved. Chapter 17: Change of Phase Conceptual Physics, 10e (Hewitt) 3) Evaporation is a cooling process and condensation is A) a warming process. B) a cooling process also. C) neither a warming nor cooling process. Waves Overview (Text p382>) Waves What are they? Imagine dropping a stone into a still pond and watching the result. A wave is a disturbance that transfers energy from one point to another in wave fronts. AIR RESONANCE IN A PLASTIC BOTTLE Darrell Megli, Emeritus Professor of Physics, University of Evansville, Evansville, IN dm37@evansville. Tesla Wireless Energy Transfer at CCC Davor Jadrijević December 10, 2009 Abstract Tesla s Long Distance High-Power and High-Efficiency Wireless Energy Transfer System is still a mystery to our technology. 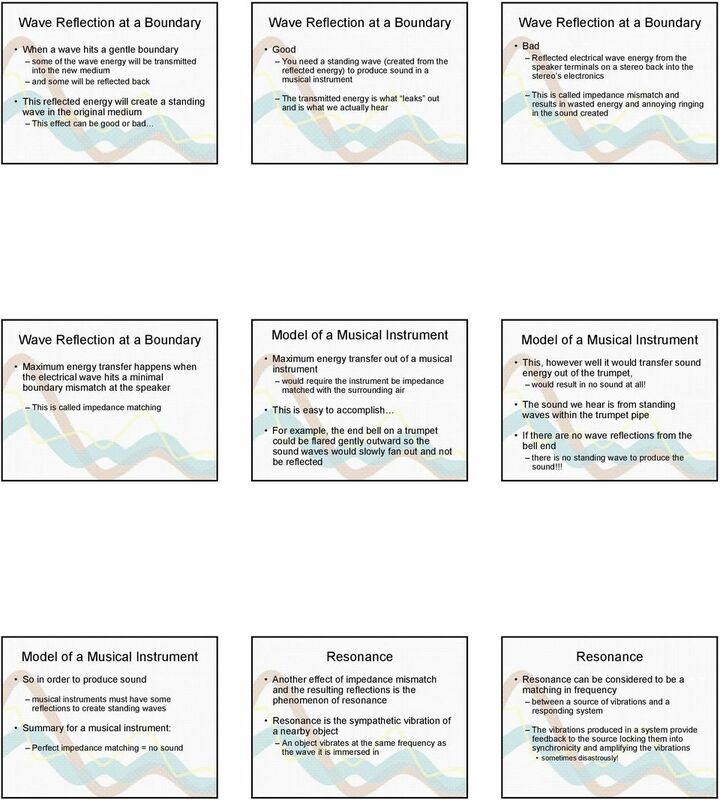 The Physics of Music - Physics 15 University of California, Irvine. Instructor: David Kirkby dkirkby@uci.edu. Lecture 14.